If you are a horse owner that searches for a quick and easy massage application to soothe your sore horse and aid in his tissue or joint recovery then soundwave therapy may be just the answer. Horse owners are starting to ask more frequently about an alternative to Pulsed Electromagnetic Field Therapy (PEMFT) due to their concerns that their horses simply don’t like it and consequently the search is on for something that is easier to use but still provides great benefits for soundness and health of the horse. The answer is the light, portable Matrix Ultra Low Soundwave Massager. Also called a Qi machine the unit is no bigger than a smartphone and the controller only weighs 7.5 oz. You can plug it into a power source or for increased mobility use the lithium battery pack for up to 50 hours without need for a recharge. The Matrix Soundwave Massager is easy to use with two settings hi/low and a timer and as the horses love the unique sensation of the gentle vibration they stand happily for the 20-30 minute treatment time. If you want to cover more territory you can even use two transducers at a time or have a friend work one side of the horse while you work the other. The Matrix Soundwave Massager is reasonably priced. For the massage therapist this modality is a great addition to your array of offerings to clients. As a caring horse owner without experience in the massage field, this is a treatment that is simple and straightforward to use on a daily basis or whenever needed. You can even use it on dogs. Interested in acupressure? This treatment can be utilized along the meridians and/or can be used to put energy into certain points. How Does Ultra Low Soundwave Therapy Work? Soundwaves that run in frequencies below 20 Hz are infrasonic (ultra low). Frequencies above 20Hz are ultrasonic. The Matrix Ultra Low Soundwave device works in the 8-14 Hz range and the use of this low level of soundwave frequency produces a valuable therapy for dramatically reducing fresh swellings, relaxing tight muscles and relieving soreness e.g. the wither and shoulder area in a showjumping equine, where the jamming of the saddle and impact from the ground on landing produce inevitable soreness despite the best saddle fit; the gluteus muscles of the dressage horse that tire from extended trot work; hoof pain due to soreness or abscesses in the eventing athlete and endurance horses will certainly appreciate a total body approach! The fact that the Matrix Ultra Low Soundwave Massager can be used close to the body without touching sensitive tissue is another reason it is so well tolerated and enjoyed by the recipients of this treatment modality and is so valuable in the treatment of any acute condition. The soundwave works by encouraging the horse’s own system to release endorphins which reduces the pain and also causes the horse to release natural cortisone to reduce swelling. Additionally acute injuries respond very well to soundwave therapy and Matrix Ultra Low Soundwave Massager helps resolve injuries more readily by removing toxins and increasing blood supply. The only contraindication for the use of soundwave therapy is where there is a fracture, because the gentle vibration might not have a positive effect. If you are frustrated with the use of high-powered PEMF exposure then you are not alone. Soundwave treatment works in holistic harmony with the horse and provides a straightforward, safe and simple therapy that horses love. Users report that in some cases temporary relief will last for days and others report that the overall condition often improves to the point of restored health. The Matrix Ultra Low Soundwave Massager is a great way to come back to what works with a therapy that supports the horse’s wellbeing, and does not just block pain, which is a rudimentary and temporary fix. Whether you are an experienced therapist or a concerned horse owner, this device is clearly a logical choice to add to your ‘toolbox’ in caring for the health of the horse. You could say, “ Nothing could be simpler.” This non-invasive therapy treatment is safe, effective, fun and easy to use for everyone. Soundwave massage treatment is a sound investment in horse health. 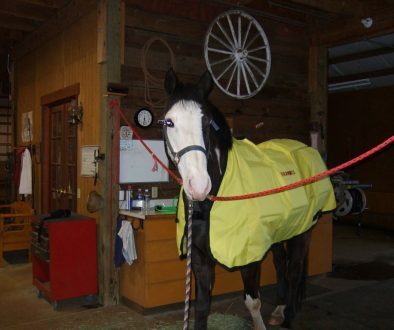 Please check out the Matrix Ultra Low Soundwave Massager here, and take the first stride to healing your horse today.